In 1970 I was a 13-year-old hippie wannabee when the Woodstock movie and soundtrack were released. Naturally, I was hooked from the start. Here was the perfect dreamed-of escape from lame suburbia—lots of great music, skinny-dipping hippie chicks, plenty of pot and acid. Plus, it was all so relatively innocent (most especially compared with the horrors that would occur just a few months after Woodstock—and an hour from where I lived—at the Altamont Speedway in Northern California’s East Bay hills). From that moment on I developed a thing for concert films that captured not only the bands and their music, but also the spirit of the times the music emerged from. As concert films tend to be documentary by nature, I’m going to bend the rules here by listing albums that, while not literally soundtracks, do serve as such to documentaries that are built on concert footage (something akin to the way the Stones’ album Get Yer Ya Ya’s Out! plays to the movie Gimme Shelter). 1. Various Artists: Woodstock. Cotillion. With its mix of music, stage announcements, and crowd chants, the original Woodstock soundtrack captures the music and spirit of that muddy, drug-addled “Three Days of Peace and Music.” These days, in addition to reissues of the original release, you can also collect complete performances by the likes of Jimi Hendrix, Joe Cocker, Sly and the Family Stone, Janis Joplin, Santana, Jefferson Airplane, and Johnny Winter. 2. The Rolling Stones: Get Yer Ya Ya’s Out! London. The Maysles brothers’ brilliant documentary, Gimme Shelter, started as a film about the Stones’ 1969 U.S. tour, their first in three years. The band—now with the great young Mick Taylor replacing founder Brian Jones on guitar—was at its creative peak, recording much of Sticky Fingers at Muscle Shoals between gigs. At the conclusion of the tour, the film necessarily morphed from a concert movie to a harrowing indictment of the tour’s final December night, when all hell broke loose at a disastrous free concert at the Altamont Speedway. 3. Wilco: Yankee Hotel Foxtrot. Nonesuch. Wilco’s 2002 LP Yankee Hotel Foxtrot can be seen as a sort of soundtrack in reverse to the documentary I Am Trying to Break Your Heart. Filmed during the album’s making, the movie charts the arrival of drummer Glenn Kotche as well as the rivalry and subsequent turmoil that led to Wilco leader Jeff Tweedy firing the late Jay Bennett. Although there’s a lot of riveting music footage in the film, from solo performances by Tweedy to rehearsal and concert sequences, the main musical focus takes place in the studio, where we get to watch the band construct songs, layer by layer, for Yankee Hotel Foxtrot. 4. The Band, others: The Last Waltz. Warner Bros. Directed by Martin Scorsese, The Last Waltz was filmed at San Francisco’s now defunct Winterland Ballroom on Thanksgiving 1977—turkey dinner included! A deliberately choreographed farewell, The Last Waltz’s original 3-LP set consists mainly of live performances from that concert, with fine performances by The Band, Bob Dylan, Joni Mitchell, Dr. John, Van Morrison, Neil Young, and others. 5. 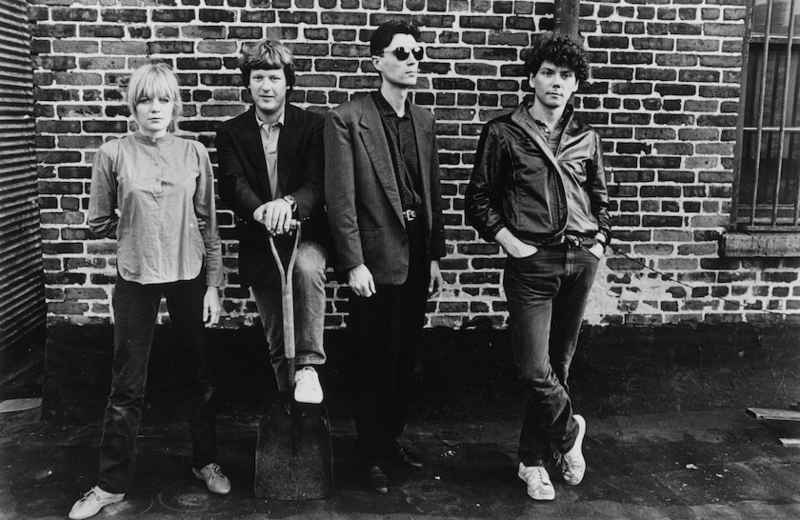 Talking Heads: Stop Making Sense. Warner Bros.
6. Otis Redding/‌Jimi Hendrix Experience: Historic Performances at the Monterey International Pop Festival. Reprise. Although there are various CD editions of the complete Monterey Pop Festival, with superstar-making sets by many who performed (including Hendrix, Janis, and the Who (and an exceptionally varied range of musical styles) this 1970 LP holds a special place in my collection. It’s not a complete representation of their sets, but from the moment a stoned, gum-chewing Hendrix introduces “Like a Rolling Stone” straight through to the electricity of Otis Redding’s sweat-drenched, “Try a Little Tenderness,” this recording is as close to time travel as you’ll find—outside, that is, Criterion’s magnificent boxed set of the D.A. Pennebaker film. 7. The Who: The Kids Are Alright. MCA. Again, this is more documentary than concert film. But that’s okay, as for Who fans The Kids Are Alright is one madcap, power-chord filled ride, and a very cool soundtrack album. Like the movie, the soundtrack is a fantastically rich diary following the band from 1964 to 1978, liberally sprinkled with interviews, TV appearances, and concert footage, including final performances by Keith Moon, who died during the movie’s final editing phase. 8. Neil Young & Crazy Horse: Live Rust. Reprise. 9. Thelonious Monk: Straight No Chaser. Columbia/Legacy. The documentary Straight No Chaser is a treasure, giving those of us who never experienced Monk in concert a vivid look at the man in action. At the piano he would hit a few (often dissonant) chords, pause to take a drag off the cigarette resting at the edge of his piano, hit a few more chords, wipe his brow, and then (say, during a Charlie Rouse tenor solo) get up and do a dervish-like dance around the stage. Drawn from different periods of Monk’s career, the soundtrack includes some previously unreleased material and fine solo performances by this sui generis artist. 10. David Bowie: Ziggy Stardust: The Motion Picture. RCA. UP NEXT: Read Soundtracks Series, Vol. 6: Derk Richardson's Top 10.